Enrollment for the 2019 Summer and Fall Semesters has begun at Mesalands Community College. Students are encouraged to register early to choose courses that best fit with their busy schedules and to make sure they are on track to graduate. 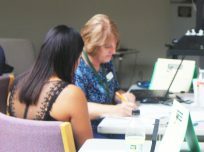 Janet Griffiths, Pre-Collegiate Faculty at Mesalands, helps a student enroll in classes. Students who enroll in 12 or more credit hours for the fall, will receive a free membership to the Fitness Center for both fall and summer semesters. Students who enroll in six or more credit hours for the summer, will receive the gym membership for the summer semester. Students may also reserve an apartment at Stampede Village, for both semesters.